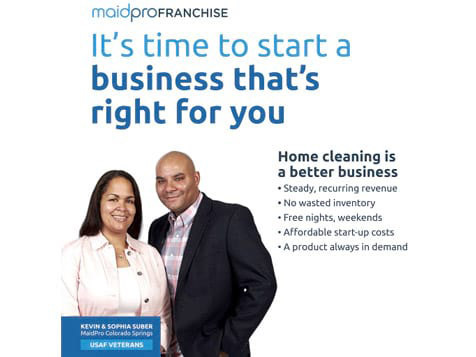 What does a MaidPro Franchise Cost? MaidPro has three investment options from which you can choose. Pick the model which fits your budget. Whether your startup budget is $75,000 or over $250,000, the MaidPro system provides tremendous flexibility. The total investment range is $74,560 - $159,610 and candidates are required to have a minimum of $75,000 liquid capital. With your home cleaning business, you'll receive MaidPro's top-rated service, training, support and hospitality. MaidPro isn't Just a Business, It's a Lifestyle. If you’ve thought about being your own boss and want control of your work, finances and life, MaidPro can offer you two things: a business that fulfills the dream of being your own boss, of paying yourself and not someone else and a business that will let you have the freedom to live on your own terms, travel when you want, spend more time with family, and the flexibility to enjoy your life. 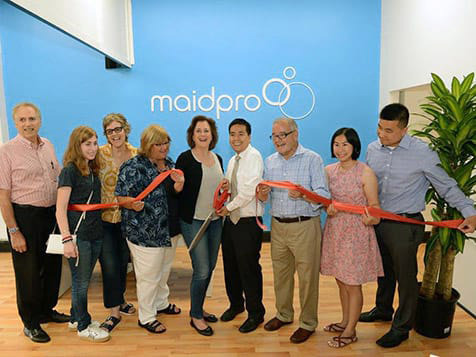 Learn more about MaidPro; a home cleaning franchise that can offer exactly what you want. Striking the balance between work and everything else isn’t easy. It’s either the corporate life of 24/7 or industries that eat up nights and weekends, making vacations hardly relaxing. Imagine owning a business that gives you a normal workday, that lets you take actual time off and enjoy your life, to travel and really live. A MaidPro home cleaning franchise does just that. 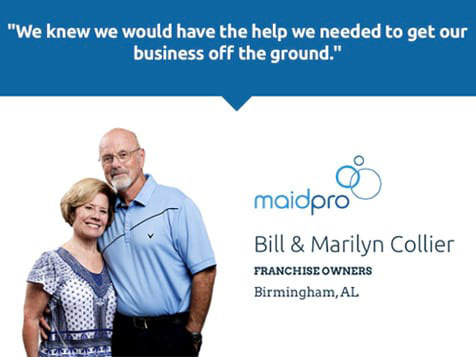 MaidPro is 100% different in our approach to business and franchising than other cleaning franchises. 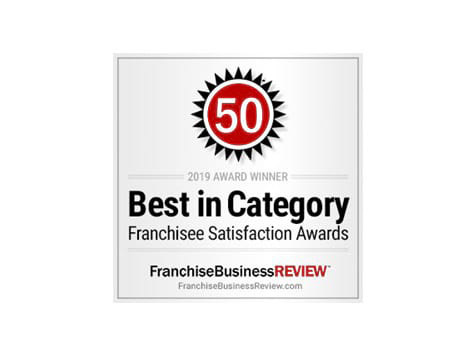 We are known as the franchisee-friendly company. Why? No "weekly" royalty fees: At MaidPro, we send our invoices out after the end of the month allowing you a full month to pay. 90 day out clause: Almost every franchisor we know has a 10-year agreement that you can't get out of. Locking you in doesn't seem very friendly to us. Flexible team size: You choose how many people you send on each cleaning. No required vendors: You're not forced to buy cleaning supplies and marketing materials from us. At MaidPro, you buy your supplies from whomever you'd like. Company owned vehicles: You will not be forced to buy a fleet of company vehicles. MaidPro only requires one and leaves the remaining purchases up to you. We've put together tools that make running a home cleaning business much simpler. No other franchisor in our industry comes close to providing you with such sophisticated technology and a well designed and executed brand. Our Cutting-Edge Technology - Our very own cloud-based (accessed online from any computer or smart-phone) management system is easy-to-use, and makes managing all aspects of your business so much simpler. Hip to Marketing - MaidPro is the only PRO by name and has an incredibly strong marketing position that will stay current and fun. MaidPro University - Our training covers 20+ courses which help owners train their PRO's professionally and easily. Recruiting Staff - MaidPro has a dedicated recruiting website with videos and easy ways for staff to apply. National Sales Center - Seven days a week and with extended hours, our National Sales Center is staffed with MaidPro professionals to answer prospective customer calls, providing details on pricing, services, and schedules. Tailored Support - MaidPro’s Home Office staff is committed to providing personalized support customized to each owner’s goals and needs. We have Webinars almost every day, a very active discussion forum, conventions, adventure retreats and office visits. You choose how you'd like to receive support. 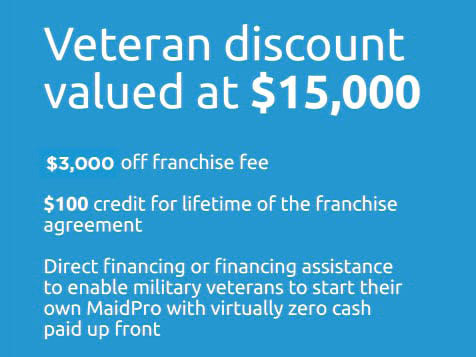 We offer discounted franchise packages for U.S. Veterans making it easy for former servicemen and women to join the MaidPro family. Learn more about the fantastic benefits of a MaidPro franchise today.